Sherri Messersmith’s successful hardcover franchise is expanded with the new softcover P.O.W.E.R. series. 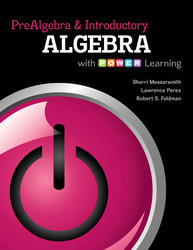 The conversational writing style, practical applications, innovative student resources and student friendly walk through of examples that users of the hard cover books noted and appreciated are also found in the pages of Intermediate Algebra with P.O.W.E.R. Learning and the rest of the series. What makes P.O.W.E.R. a unique tool for the classroom? A major challenge in developmental courses is that students at this level struggle with basic study skills and habits. Maybe this is one of their first college courses or perhaps they are adults returning to school after a long absence. Either way, many of the individuals taking this course don’t know how to be good students. Instructors often don’t have the time, the resources or the expertise to teach success skills AND the math concepts. The new team of Messersmith, Perez and Feldman offer a scientifically based approach to meet this challenge. The P.O.W.E.R. Learning Framework was developed by successful author, psychologist, student success instructor and researcher, Bob Feldman. It is a method of accomplishing any task using five simple and consistent steps. Prepare. Organize. Work. Evaluate. Rethink. This framework is integrated at every level of the text to help students successfully learn math concepts while at the same time developing habits that will serve them well throughout their college careers and in their daily lives. Making Connections – Sherri Messersmith is recognized for preparing her students for success by refreshing their knowledge of arithmetic. By helping students see the connection between arithmetic and algebra, Sherri found that her students were more confident in their abilities as they progressed through the course. This classroom tested practice was integrated into the texts so that both instructors and students could benefit. Messersmith accomplishes this by including arithmetic examples for most sections before the use of algebraic examples. Also, the author has developed through classroom use a series of Basic Skills Worksheets that can easily be integrated into the classroom. Presenting Concepts in “Bite Size” Pieces – By breaking down the sections into manageable pieces, the author has identified the core places where students traditionally struggle and then assists them in understanding that material to be successful moving forward. For details on how the author has done this, check out the TOCs for Intro Algebra, PreAlgebra, Intermediate Algebra and the combo book PreAlgebra and Introductory Algebra. Mastering Concepts--With the textbook and Connect Math hosted by ALEKS, students can practice and master their understanding of algebraic concepts. Messersmith is rigorous enough to prepare students for the next level yet easy to read and understand. The exposition is written as if a professor is teaching in a lecture to be more accessible to students. The language is mathematically sound yet easy enough for students to understand. P.O.W.E.R. is a method for accomplishing any task based on five basic steps. Prepare. Organize. Work. Evaluate. Rethink. It is integrated at the section level in the Messersmith paperback series to guide students through learning math concepts. The P.O.W.E.R. framework was developed by Dr. Robert Feldman and integrated into his first year experience/student success books, POWER Learning: Strategies for Success in College and Life and POWER Learning and Your Life: Essentials of Student Success. The framework has also been integrated into Dr. Feldman’s Psychology and Your Life text and is the basis for the student success program at UMass at Amherst where he is Dean. Connect Math hosted by ALEKS is the combination of an online homework manager with an artificial-intelligent, diagnostic assessment. Each homework problem is consistent with the problem included in the text and was hand-picked by instructors and subject matter experts. Instructors will have a platform that was designed through a comprehensive market development process involving full-time and adjunct math faculty to better meet their needs. -Instructors can deliver assignments, quizzes, and tests easily online -Students have 24/7 online access to an integrated, media-rich eBook -Online study assets are specifically tied to the textbook. Worksheets fall into three categories: review worksheets/basic skills, worksheets that teach new content, and worksheets to reinforce/pull together different concepts. These worksheets are a great way to both enhance instruction and to give students more tools to be successful in studying a given topic. They are ready-made materials for instructors! Perfect for adjuncts! Especially those who teach at more than one school and don’t have time to create tools for their classes. The worksheets help to standardize the level at which the course is taught. To help adjuncts keep pace with full-time instructors. *Available in Connect hosted by ALEKS and ALEKS.